If you are looking for a unique Halloween costume for a child in your family take a look at this special idea and make it your own. This is a guide about making a letter to grandma costume. My daughter, Mackenzie didn't want to be "just like everyone else for Halloween". So I let her pick. We went to my fabric cabinet and she said "Mom, I want to be a "letter". I replied "which letter?". She said "A letter to Grandma"
So I took some white fabric and drew with blue marker the blue lines horizontally and the red line down the side of the page for the margin, vertically. I sewed the front and the back just as I would making a quilt and cut the three holes out of the fabric just as a piece of paper would have and did a zigzag stitch. I wrote what she told me to write with black marker. Cut a hole in the top of the "page" for her face and arm holes so she can carry her trick or treat bag. It's so hard being the youngest. Today Robbie, Timmy, and Amanda held my arms and legs down and put Mac and Cheese on my belly and watched while the dog ate it off. PLEASE HELP! "P.S. 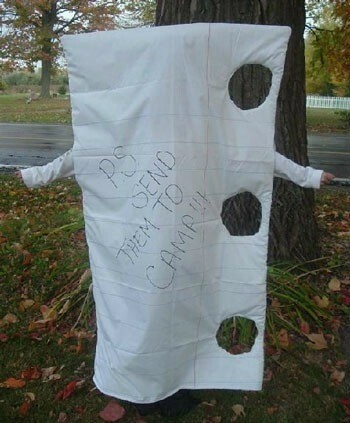 PLEASE SEND THEM TO CAMP!" I know where she gets her creative ideas from. Very smart! You and your daughter are so clever. 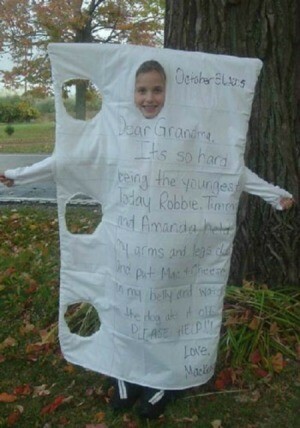 What a great idea she had for a costume and you are so smart to be able to make it happen.